Denmark is not part of the euro; they have their own currency, the krone. So far, they appear likely to become the first country to abolish cash. The Danish government is currently pushing to free some stores, restaurants, and petrol stations from accepting cash payments as Britain was testing last year in Manchester. The Danish government is currently proposing to scrap cash transactions entirely as part of a package of cost-saving measures introduced ahead of the Danish election in September. 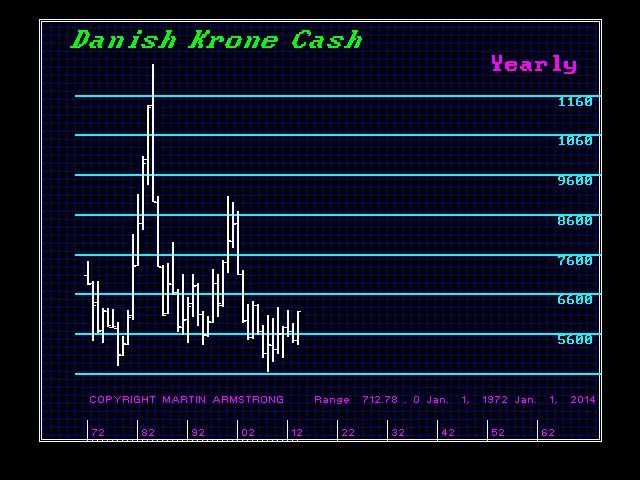 The Danish krone peaked against the dollar in 2008, and the major low for the krone (high in the dollar) took place in 1985 showing an overall rally of 36 years. Denmark is certainly poised to take that step, for behind the curtain this is really a measure to secure taxes and protect the banks from complete collapse preventing bank runs. This appears to be the big issue that is likely to unfold with the ECM turning point at the end of September 2015. There will likely be a major capital disturbance post-2015. because unless ALL nations abolished cash simultaneously, there will still be the likelihood of capital flight from such nations running to those who have not abandoned cash. We stand on the verge of Economic Totalitarianism that will lead to the total control of money by the state. No one will be able to buy or sell without government approval. The USA has already provided for the revocation of a passport if you owe the government more than $50,000. Passports in Rome were invented not to travel between nations, but to be able to travel to prove you did not owe money to the state and hence were free to travel. History simply always repeats – only the names change.